SCVHistory.com GA4503 | Hart High School | 9th Grade, Group C (3 of 3), 1945-46. 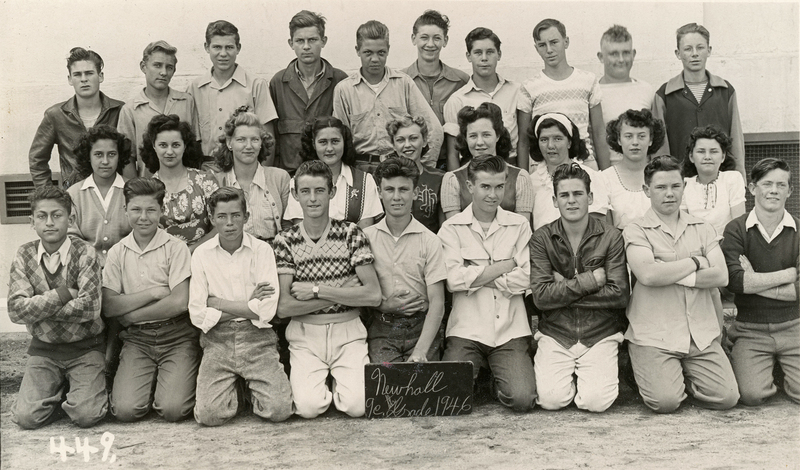 Hart High School 9th grade class, Group C (3 of 3), 1945-46. Hart, the Santa Clarita Valley's first high school, opened in 1945 with (only) 9th graders from all corners of the SCV. In 1945-46 they were housed on the Newhall Elementary School campus, where this photo was made; the separate high school was not yet built. These 9th graders went on to become the first Hart High graduates in 1949 ... the famous '49ers. Top row: Laney Kidder, John Braford, Claud Jones, Jay Willet, Merl Gray, Eddie Kelso, Eugene Howell, Jim Harbison, Don Barnett, Pete Smith. Middle row: Kathryn Chacanaca, Jackie Singmaster, Ollie May Culver, Joy West, Mrs. Phillips, Jeanette Hall, Ruth Anne Sublet, Frances Fulstone, Joah Quinn. Front row: Neil Aitken, Phil Hoskins, Bob Whisler, Tom Christie, Paul Hoskins, Frank ?, Harry Kidder, John Barnhill, Bob Waltrip. GA4503: 9600 dpi jpeg from original 3x5-inch print, collection of Dean and Gwen Booth Gallion.